Friday, January 15th, 2016, 2030 Hrs, 44 degrees, windy with chill factor (Feels like 38!). Today is a very yucky day! We had a wind storm most of the day, dust and debris flying everywhere from the Southwest and it’s really cold during the day time and chill factor just before dark. This morning after I woke up, I had to take the solar panel down for a while so which it’s means I have no power on both sides for the most of the day. If the weather is good by the time tomorrow morning, I will reset the solar panel again! 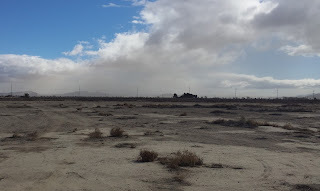 Wind storm cloud with dust floating facing Southeast area. I couldn’t do any that much today but feeling RV rocking, watching dust flying through my windows, covers wind drafts on the bottom of the front door with a towels and I could hear a little bit of whistling in here and I couldn’t find it where it comes from, but I can imagine it is coming from the main door as I could feel cold air coming in from this door. I cleaned up a bit at about 11 this morning on the floors and desk top and had to clean it up again at around 2 pm. Lots of dirts! I hates this part, clean twice in one day! At about 4:45 pm, wind dies down for a while, but still gusty, I fired up the generator to charge up my battery on my cell phones and laptop which it was nearly dead and finally shut it down after all battery fully charged up! Again the wind started to pick up at about 6:30 pm. Hopefully I can catch up tomorrow to get things done and take some eBay orders to the HQ Post Office!